What is the right way to bulk? My goal is to get bigger. What is the right way to gain weight before shredding? Despite the research that recommends otherwise, "old school" bulking and cutting still persists in the fitness industry. A safe and effective alternative is a clean bulk. The old style of bulking involves more than just lifting heavy weight, it focuses on the nutritional aspect of gaining weight by dramatically increasing the amount of calories you eat. While an increase in calories is absolutely necessary in order to "bulk," many of these calories contribute to excess fat gain as opposed to supporting the lean muscle gains you're looking for. For your fat intake, 0.5 grams per pound of body weight (Ex: 150 pounds = 75 grams of fat per day) - There are 9 calories in 1 gram of fat. You'll be getting 675 calories from fat. Eat clean - This one should be the most obvious but the calories you are consuming must be clean as a whistle. No fast food, processed foods, or fried foods. Sugar is on the blacklist. Eat a diet that is rich in vegetables and fruits. Opt for cleaner and leaner cuts of meat such as chicken breasts or salmon. Drink your water - Water is extremely important during a bulk. You are dramatically increasing your caloric intake which means your body is working that much harder. Help it out by drinking approximately a gallon of water throughout the day. Lift smart - Before you start lifting for size, know what you're doing. Perfect your form for every exercise, especially the classics: squat, deadlift, overhead press. Those exercises will ensure you get to the size you want when done correctly. When done incorrectly, they'll make sure that you'll be nursing an injury on the couch. DISCLAIMER: This site offers health, fitness and nutritional information and is designed for educational purposes only. You should not rely on this information as a substitute for, nor does it replace, professional medical advice, diagnosis, or treatment. 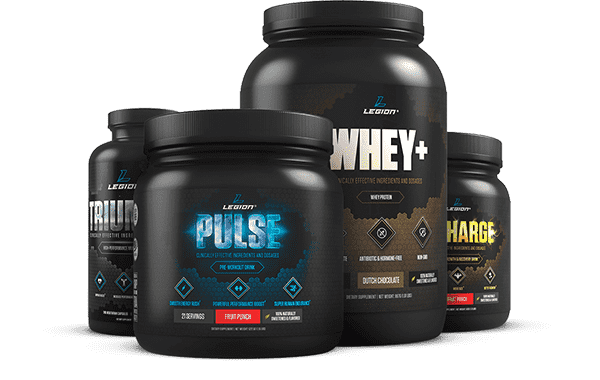 Get results faster with supplements that work from Legion Athletics - the only brand we use and trust. Terms Privacy Use of Illustrations © 2019 WorkoutLabs, LLC.